"Spirit guide" is a term used by the Western tradition of Spiritualist Churches, mediums, and psychics to describe an entity that remains a disincarnate spirit in order to act as a spiritual counselor or protector to a living incarnated human being. Traditionally, within the spiritualist churches, spirit guides were often stereotyped ethnically, with Native Americans, Chinese or Egyptians being popular for their perceived ancient wisdom, saints, or enlightened individuals. Nevertheless, the term can also refer to animals or totems, controls, angels, or nature spirits. They may be viewed as any type of non-physical, perhaps an alien, however they are perceived. According to theosophical doctrine, spirit guides are persons who have lived many former lifetimes, paid their karmic debts, and advanced beyond a need to reincarnate. Each is assigned to watch over an incarnate person, not only on this Earth, but on many other planets throughout the universe. Many psychics believe that spirit guides are chosen on "the other side" by us and God(s) before we incarnate and that they guide us to follow our life's plan. Some people [who?] 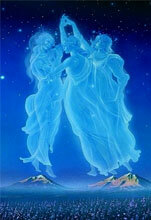 claim it is possible to meet one's spirit guide in dreams or on the astral plane (see Astral Projection). Their guidance is said not to require mediumship. This is the "Dream Guide." The Gnostic religious view of a spirit guide is that, on the other side, you and your guide planned your life on earth before you incarnated. You live the life and your spirit guide helps you along the way. Thus, if this is the case, everyone has a spirit guide because everyone planned their life prior to being born. Therefore, the spirit guide couldn't be a living relative or an animal, but could present itself as such. Furthermore, a guide is said to have lived at least one earthly life before becoming a spirit guide so that they can understand the struggles of human life. Spirit guides can be quite humorous and manifest positively in the physical, faster now than ever before. Each guide usually comes to you for a specific purpose. It could be to work with you on your creative abilities, healing issues, spiritual development, etc. A guide can also save you from or during an accident, by entering your body, or stopping time. Many well-known psychics have publicly described their guides. Helena Blavatsky talked about being advised by "Mahatmas", discarnate personages from India and especially Tibet, who dressed and behaved according to the dictates of their respective cultures. Alice Bailey also described having contact with a spirit teacher whom she called "The Tibetan." American Spiritualists of the 19th and 20th centuries often described their guides as resembling Native Americans. One popular spirit guide of this type, encountered by many Anglo-American Spiritualists, was named White Hawk. Among African-American Spiritualists, especially those in churches that were founded by or influenced by Mother Leafy Anderson, the Native American guide was named Black Hawk, and was presumed to be the spirit of the Fox tribe warrior of the same name. Others described their guides in terms of what sounds like a mythologized Ancient Chinese appearance, and Irish guides were also common. Today, Sylvia Browne still follows the standard of having a guide with a Hindu-like appearance, with her hair in a long braid and loose-fitting clothing. Browne's Spirit Guide is to be named "Francine". Francine has said she has a close friend on the Other Side named "Rahim", who is also another Spirit Guide, who is said to have a middle-eastern appearance, wearing a turban. Derek Acorah, a British medium often refers to his spirit guide, Sam, and while communicating with spirits often calls the spirit by his name. (i.e. "Can you tell me his name, Sam?") Sam is an Ethiopian male who Acorah was a friend of in a past life some 2000 years ago. Communication with spirit guides is usually telepathic, clairaudience, with archetypes and visual imagery, clairvoyance, observed during meditation, dream time, or just learning how to focus, look and listen to messages received. Some people call this method of connection, channeling. The more you practice, the easier it gets. Spirit guides can go by many names, Often they connect with more than one person at a time, using identities that are comfortable to those they communicate with.